If you’ve ever camped in a tent, then you’ve probably been frustrated with traditional tent pegs. Be it metal or plastic, they both have their challenges. Trust me when I tell you that their is still hope. A company called Liberty Mountain is distributing a tent peg that will revolutionize the tent camping world. They call their product the Psyclone Tent Peg and I’ve never seen anything quite like it. Let’s take a look at what makes these tent pegs so special. 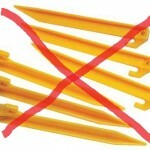 Traditional tent pegs are basically just stakes that go through a loop in the tent fabric. Most of the time we use a hammer to push them into the ground. I’m sure we’ve all bent a metal peg or two when they unexpectedly hit a rock on their way down. 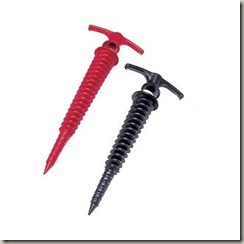 And the plastic pegs? Well, they can only take so much of a beating. For the sake of argument, let’s say that all of our tent pegs went into the ground. When it comes time to pack up, those pegs can be nearly impossible to remove. The only hope is the the ground is soft and that the peg will slide out easily. These pain points of traditional style tent pegs is where the Liberty Mountain Psyclone pegs excel. First off, they don’t need to be hammered into the ground. You simply grab the tee handle and twist the peg into the ground like a screw. Removal is just as easy, simply twist the tent peg in the opposite direction to unscrew it from the ground. An added bonus is that the design of this particular tent peg works great in softened ground such as snow and sand. This one seems like a no-brainer for me and they’re not just for those who sleep in tents. You can also use them for your dining tent if you’re like me and use a dining tent outside of your RV. With a price point of around $1.75, they also won’t break the bank – making this a very attractive upgrade. Are you ready to switch from traditional tent pegs? Let us know in the comments.